A French blogger who’s blog is called Technofeliz did a post on The Cat Piano and pointed out a look-a-like for The Poet in the film. It is the character Blacksad from the Spanish comic series by Juan Diaz Canales and Juanjo Guarnido. When we were doing the character designs for our film, Ari mentioned this character and how cool it looked. I hadn’t heard of it but then found a really nice postcard picture from one of the comics while in Annecy. 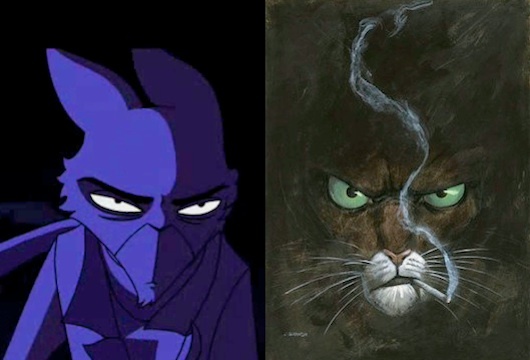 Our character deffinitley owes a bit to the beautiful design of Blacksad. This got me thinking about which designers and characters that we drew inspiration from when designing the film. 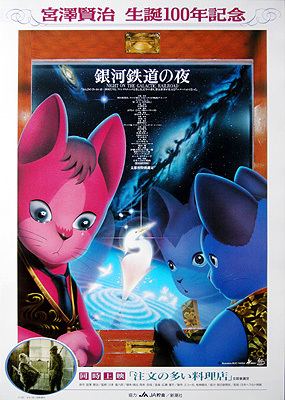 The first one that comes to mind is the e cat characters of Japanese comic artist, Hiroshi Masamura. 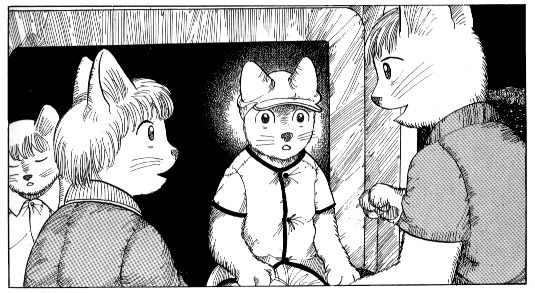 Both Ari and I immediately loved the cat designs of Masamura and we discovered one of his comics was turned into an anime feature called Night on The Galactic Railroad in 1985.We watched the film which had cats in space in a train… what a combination hey?